In this study, the relationship of dominant period between soil-structure interactions was investigated to determine the resonance period intervals of buildings. The signal analysis were applied to determine the resonance regions between building periods, T, and soil periods, TZ with (0 and 2) seconds. Earthquake resonance effectivity curves were obtained for soil classification. Turning points of earthquake resonance effectivity curves were defined characteristic periodes (TA – TB). According to this signal analysis, soil interval period between T= (0.5-1.5) TZ seconds becomes the building store number resonance risk region. Building store number curves of resonance region which changes as the function of the soil dominant period were obtained by using the relation between the building natural period and the store number or building height. Building store number curves of resonance region which changes as the function of the building rigidity were also obtained by using the same properties. In determination of resonance risk region; 1- application according to rigidity code values, 2- application according to different rigidity code values and building height, 3- Application for the control of soil-building resonance relationship of old buildings were given. In conclusion, if the dominant periods of soils are known, store number and the height of the building designed could be determined as practical from the resonance region curves. This application is useful simple method for the estimation of the soil-structure interaction during the earthquake. Also, in this study, different approaches in the calculations of soils dominant period for different layer thicknesses and the earthquake resonance relationships of buildings were discussed. In this context, for calculation of dominant period, it is shown that total depth of the layer should be used 50 meters according to the disaster regulations and surface wave active depth. Bu çalışmada binaların rezonans periyot aralıklarını saptamak için zemin yapı arasındaki hakim periyot ilişkisi incelenmiştir. (0.2 ile 2) saniye arasındaki bina, T ve zemin hakim periyotlarının, TZ, oluşturdukları rezonans bölgelerini saptamak için sinyal analizi uygulanmıştır. Zemin sınıflaması için deprem rezonans bölgesi etkinlik eğrileri elde edilmiştir. Deprem rezonans bölgesi etkinlik eğrilerinin dönüm noktaları karakteristik periyot olarak tanımlanmıştır. Sinyal analizine göre, T= (0.5-1.5)TZ saniyeler arasındaki zemin periyodu aralığı bina kat adedi rezonans risk bölgesi olmaktadır. Bina doğal periyodu ve kat adedi veya bina yüksekliği arasındaki ilişkiler kullanarak zemin hakim periyodu ile değişen rezonans bölgesi kat adetleri eğrileri elde edilmiştir. Aynı özellikleri kullanarak bina rijitlik özellikleri ile değişen rezonans bölgesi kat adetleri eğrileri de elde edilmiştir. Bina kat adedi rezonans risk bölgesi saptamasında; 1-Rijitlik kot değerine göre uygulama, 2- Bina kot yüksekliği ve farklı rijitlik değerlerine göre uygulama, 3-Eski binaların zemin-bina rezonans ilişkilerinin denetimleri için uygulama örnekleri verilmiştir. Sonuç olarak, zemin hakim periyodu bilindiğinde, tasarlanan bina yüksekliği kat adedi rezonans bölgesi eğrilerinden pratik olarak saptanabilmektedir. Bu uygulama depremlerde zemin yapı etkileşimini tahmin etmek için basitleştirilmiş yararlı bir yöntem olmaktadır. Ayrıca, bu çalışmada deprem zemin hakim periyodu hesabında farklı katman kalınlığı kullanımları ve bina deprem rezonansı ilişkisi üzerine farklı yaklaşımlar tartışılmıştır. Bu bağlamda, zemin hakim periyodu hesaplanması için, zemin toplam derinliğinin yönetmelik düzenlemeleri ve yüzey dalgası aktif derinliğine göre 50 metre kullanılması gerektiği gösterilmiştir. ABM Müh. Müş. Ltd. Şti., Kocaeli Büyükşehir Belediyesi Aslanbey Belediyesi Revize Planına Esas Jeolojik-Jeoteknik Etüt Raporu, Kocaeli, 2005. ALFARO, PUJADES L. G., GOULA X., SUSAGNA T., NAVARRO M., SANCHEZ J., CANAS J. A., Preliminary Map of Soil's Predominant Periods in Barcelona Using Microtremors: Pure and Applied Geophysics, 158, 2499-2511, 2001. ANASTASİA K. E., ATHANASİOS I. K., Correlation of Structural Seismic Damage with Fundamental Period of RC Buildings Open Journal of Civil Engineering, 3, 45-67, 2013. ARNOLD C., Earthquake Effects on Buildings. Chapter 4, Federal Emergency Management Agency, USA. www.fema.gov/…/fema454_ch…2013. Afet Bölgelerinde Yapılacak Yapılar Hakkında Yönetmelik: T.C. Bayındırlık ve İskan Bakanlığı, 2007. AYTUN A., (2001), Olası Deprem Hasarını En Aza İndirmek Amacıyla Yapıların Doğal Salınım Periyotlarının Yerin Baskın Periyodundan Uzak Kılınması: Uşak İli ve Dolayı (Frigya) Depremleri Jeofizik Toplantısı, (73-82)., 2001. BASHAR A., Shon, Study on the Fundamental Perıod of Vibratıon for Buildings with Different Configurations, 2015. A Thesis Submitted To The Graduate School of Natural and Applied Sciences of Atilim University In The Department of Civil Engineering. CHİAUZZİ L., MASİ A. & MUCCİARELLİ M., CASSİDY J. F., KUTYN K., TRABER J., VENTURA C. & YAO F., Estimate of Fundamental Period of Reinforced Concretebuildings: Code Provisions vs. Experimental Measures inVictoria and Vancouver (BC, Canada), 15WCEE, 2012. CHUN Y.S, YANG J.S., CHANG K.K. and LEE L.H., 200, Approximate Estimations of Natural Periods for Apartmentbuildings with Shear-Wall Dominant Systems:12WCEE. Eurocode 8: Design of Structures for Earthquake Resistance. Part 1: General Rules, Seismic Actions and Rules for Buildings, European Standard EN 1998-1:2004, Comité Européen de Normalisation, Brussels, 2004. GOEL R. K., and CHOPRA A. K., 1997, Period Formulas for Mo- ment—Resisting Frame Buildings, Journal of Structural Engineering, Vol. 123, No. 11, pp. 1454-1461. GOEL R.K., Chopra A. K., Improvements ın Code Analysıs of Buıldıngs Usıng Motıons Recorded, Durıng Earthquakes, Civil and Environmental Engineering , College of Engineering,Berkeley. HWEİ P. H., Fourier Analysis. Simon and Shuster, NewYork, 1970. 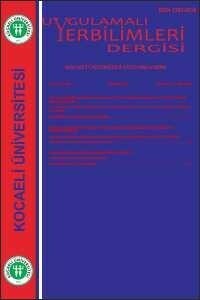 KEÇELİ A. D., Uygulamalı Jeofizik JFMO Eğitim Yayınları NO:9, 2012. KEÇELİ A. D., Neden Jeofizik Mühendisliği Zemin Etütlerinde Zorunlu Olmalı: Jeofizik, 18, 15-28, 2013. KEÇELİ A.D., CEVHER M., Soil dominant Period and Resonance Relation of Building Height, JEOFİZİK: Vol. 17 No 1-2, 2015. LAW K.T. and WANG J.G.Z.Q., Siting in Earthquake Zones: Amazon.co.UK, 1994. MAGDY I. S., Estimation of Period of Vibration for Concrete Moment-Resisting Frame Buildings, Housing and Building National Research Center HBRC Journal, 2014. MARİO J. R., Seismic Response of Soil – Structure Systems in the Valley of Mexico: Instituto Mexicano del Petroleo. SAFİNA S., Relationship Soil-Structure Upon Fundamental Dynamics Properties of Ordinary Buildings. Eleventh World Conference on Earthquake Engineering, 1996. SALİNAS V., SANTOS –ASSUNCAO S., CASELLES O., PEREZ-GRACİA V., PUJADES Ll. G., CLAPES J., Effects on the Predominant Periods due to abrupt Lateral Soil Heterogeneities: 15 WCEE LISBOA,2012. Türkiye Bina Deprem Yönetmeliği (TBDY), 2018. WASTİ TANVİR S., UBC Hesap Esasları ve Yeni Türkiye Deprem Yönetmeliği. ZHAO J. X, Comparison between VS30 and Site Period as Site Parameters in Ground-Motion Prediction Equations for Response Spectra,4th IASPEI / IAEE International Symposium: Effects of Surface Geology on Seismic Motion, August 23–26, · University of California Santa Barbara, 2011.
http://ees.elsevier.com/hbrcj Mario Paz, International Handbook of Earthquake Engineering: Codes, Programs, and Examples: PP. : 545 Springer, 1994.